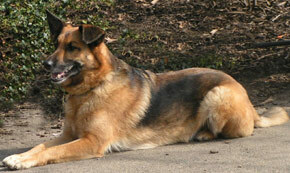 A medium size dog of exceptional beauty and working ability used for many purposes, including herding, tracking, agility, obedience, and police work. The Malinois was bred around the city of Malines which is where the name came from. They are smart, hard-working, and confident.The breed is used as a working dog for tasks including smelling for explosives, accelerants (for arson investigation), and narcotics. They track humans for suspect apprehension in police work and search and rescue missions. The U.S. Secret Service uses Belgian Malinois to guard the grounds of the White House. The Belgian Malinois is a very healthy, square dog. It is is elegant looking with a very proud posture in the head and neck. They are strong, agile, muscular, alert, and energetic. The whole dog is very bulky. The male is more built and impressive and the female. The female has a distinct feminine look. The Belgian Malinois has a lifespan of 14-16 years. They have short coats so they are easy to groom for a medium size dog. But, they do have shedding seasons so during those seasons and on a regular, you should frequently brush/comb them.